Baby Mirror: Safe Or Distracting? 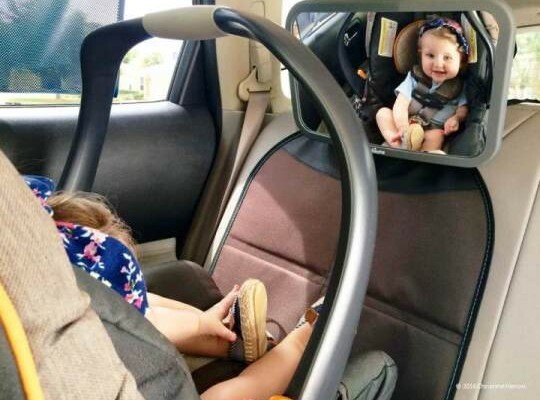 A baby mirror to monitor the baby in the back seat of the car has become a popular gift at baby showers over the last few years and for good reason. The safest place for a baby in a car is securely fastened into a rear-facing infant seat mounted in the rear seat of the vehicle. 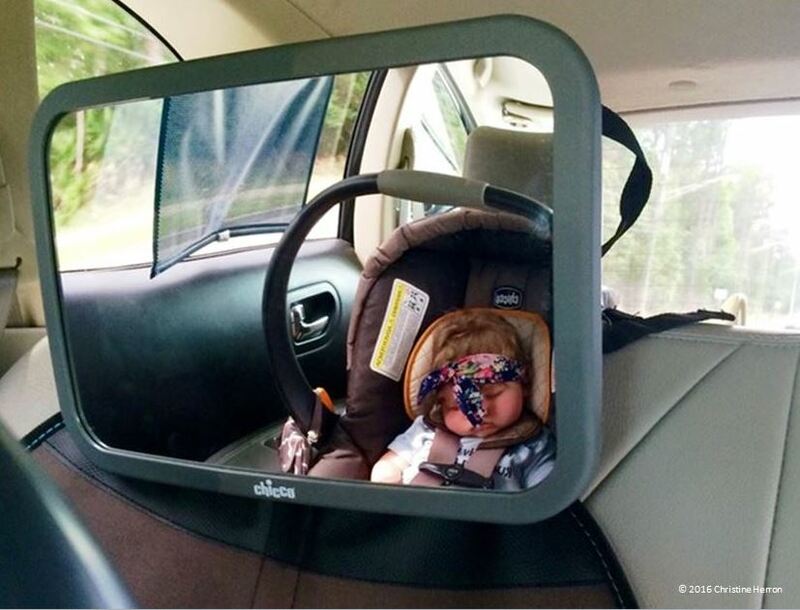 That makes it difficult for the parents to see the child so, a forward facing baby mirror mounted over the infant safety seat is the best compromise. However, the question comes up, is a baby mirror a good safety tool or just another distraction added to all the other distractions that make driving so dangerous today? The answer is; it all depends on how it’s used by the driver. Parents of a newborn baby love watching this incredible miracle that they’ve created but you can watch too much. If a driver is tempted to watch for the baby’s reaction while talking to her, he or she can take too much time from the critically important job of keeping his or her eyes on the road. Studies have shown that most traffic crashes happen within three seconds of a driver distraction. If you take your eyes off the road to look at your baby for just two seconds while driving at 45 mph, your vehicle will travel over 130 feet. A lot can happen in that time and distance. If an emergency should happen in that space, it’ll take, on average, an additional 84 feet to bring your car to a stop. Good thing you have a good, safe baby seat. To protect that precious bundle of joy, the driver needs to keep his or her eyes on the road at all times. Give the baby the same amount of attention that you would give to other vehicles in your rearview mirror. Just a quick glance every 10 to 15 seconds just to make sure everything’s OK. Make sure that your rearview mirror is positioned on the road behind and not aimed mostly at the baby mirror. As long as you’re not allowing the baby mirror to be a distraction, it can be an excellent safety tool. Babies are constantly exploring and learning new things. One thing they tend to learn, as early as 12 months, is that they’re capable of unbuckling their seat harness and crawling out of their child seat. One study showed that 75% of children who discover they can unbuckle their seatbelt were ages three and under. Once they make this miraculous discovery, it can be very hard to keep them buckled up. Checking to ensure that your child is safely buckled in is one of the best reasons for investing in a baby mirror. If your child is getting out of his or her seat, don’t panic and never try to deal with it from the driver’s seat while the car is in motion. Pull as far off the side of the road as possible, then get out and deal with the situation. Remember that the safest place to interact with your child is at home. 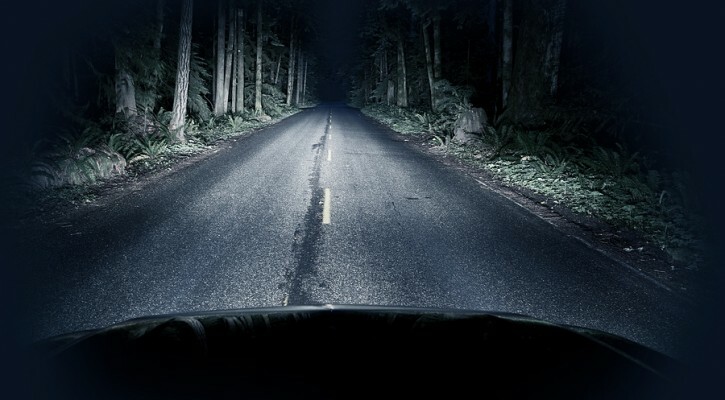 While you’re driving, pay attention to the road so that you can both get home safely. Most parents of a newborn child would do anything they could to protect that child from harm but there’s one critically important safety device that seems to be a well kept secret for most new parents. In 2014, the American Academy of Pediatrics conducted a study of new parents who were taking their newborn child home from the hospital. The study showed that 93 percent of new parents made at least one critical error in placing or attaching their infant car seat for the first time. 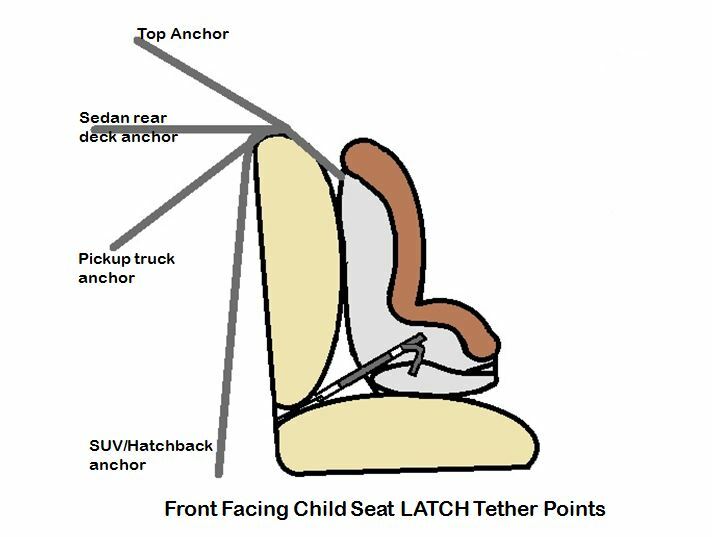 Most new parents seem to know about using the seat belt to secure an infant car seat but, it seems that very few know about or use their vehicle’s LATCH (Lower Anchors and Tethers for Children) system. 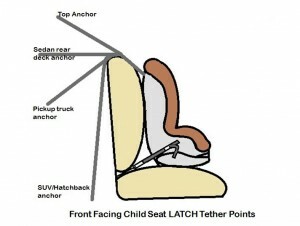 The LATCH system has been required on all infant child seats and motor vehicles manufactured after September 1, 2002. While the LATCH system may be there, it’s often difficult for parents to find and use. 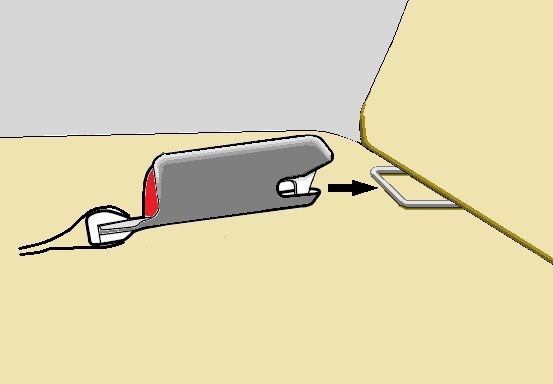 The LATCH system consists of tether points (as in the photo above) located both on the seat itself and, for forward facing child seats, behind the rear seat. 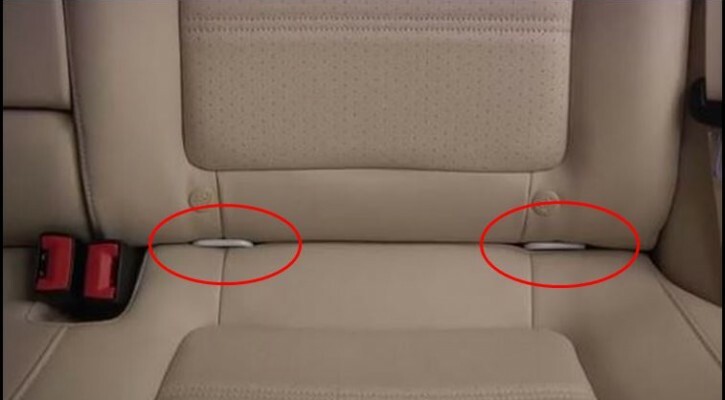 Latches built into the infant seat or seat base are designed to hook onto the anchor points located between the seat cushions. These tethers, once they are latched and tightened, are extremely effective in holding the child seat securely in place during a crash. When your child is old enough for a front-facing child protective seat, there’s an additional tether to prevent the top of the seat from flying forward in a crash. The point that it tethers to depends on the type of vehicle you have. 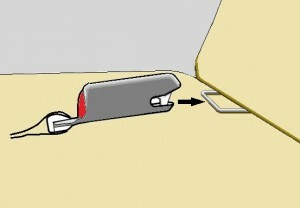 Follow the directions that came with your child seat when attaching the LATCH points. If the child seat user’s manual is unavailable, you can generally find a user’s manual online at the child seat manufacturer’s website. If you’re still unsure about how to correctly install your child seat, you can contact the local child seat inspection station where a trained child seat inspector can show you how to correctly install the seat. Always place your baby’s child seat in the rear seat but keep in mind that, in certain crashes, the front seat can break, fall back and possibly injure the child seated behind. If possible, always place the child seat behind an empty front seat or behind the lightest front seat passenger. Another thing that seems to be a secret is that car seats have expiration dates. Plastic seat components exposed to the sun and heat in the interior of a car over long periods can start to break down and weaken. The expiration date is marked on the bottom of the seat. If a previously used seat is near or past its expiration date, dispose of it. Don’t be tempted to sell it at a garage sale where it could endanger another child. If you’re in the market for a new car, the Insurance Institute for Highway Safety (IIHS) has information on the safest cars and those cars with the easiest to use LATCH systems. Is The Car Radio Distracting? In still more research on distracted driving, researchers in the United Kingdom looked at whether or not the car radio could be distracting to drivers. The researchers from University College Dublin, Ireland conducted a small scale study using 36 drivers in a full size driving simulator to test whether or not the car radio interfered with a driver’s attention enough to pose a danger. The data seems to support past research that has been conducted on the use of cell phones while driving. The study was designed to test what’s known as the “perceptual load theory of attention.” That theory states that people only have a limited amount of attention to work with and, once they reach their limit, they can’t process any more information. In this case, the researchers wanted to see if information overload by one sense (hearing) could affect another sense (sight). The subjects were divided into two groups; a “low attention load” and a “high attention load.” Those in the low attention load group were told to listen to the traffic report on the radio and to note when the traffic reporters switched from male to female, a task that didn’t require a lot of attention. Those in the high attention load group were told to listen for traffic reports regarding a specific highway; a task that required a good deal more attention. While both groups drove over the simulated course, the researchers would randomly place a large gorilla or an elephant at the side of the road. The researchers found that 71 percent of those in the low attention load group noticed the gorilla or elephant. In the high attention load group, only 23 percent noticed the large, misplaced animals on the side of the road. The high attention load group also had greater difficulty in obeying yield signs and maintaining proper speed and lane position to avoid hazards. The fact that the high attention load group experienced difficulty while listening to the radio for comprehension parallels the results of a study conducted by Carnegie Melon researchers in 2008. In that study, subjects were tested first while driving over a simulated driving course and then, when driving over a similar course while carrying on a simulated cell phone conversation; all while their brains were being scanned by an MRI. The study was designed to show what areas of the brain showed the most activity while performing a task. In the first test, without the use of a cell phone, the area of the brain that controlled for spacial awareness (where your body is in relation to other objects around it) was the most active. In the second part of the study where subjects drove while carrying on a simulated cell phone conversation, the area of the brain that showed the most activity was the area that controlled language comprehension and the activity in the spacial awareness area was reduced by 37 percent. That convinced the Carnegie Melon researchers that “multi-tasking” is a myth; the brain isn’t capable of handling two or more tasks equally at the same time. To concentrate on one task the brain has to rob attention from another control center. For most drivers, listening to the car radio is a very low attention load activity. For most, listening to the car radio is just background noise. If the average driver were asked what song just played or what product was just advertised, he or she would be unable to say. Usually, the car radio isn’t a distraction at all but, when listening for comprehension, the brain has to shift processing power away from paying attention to the road to paying attention to the radio. 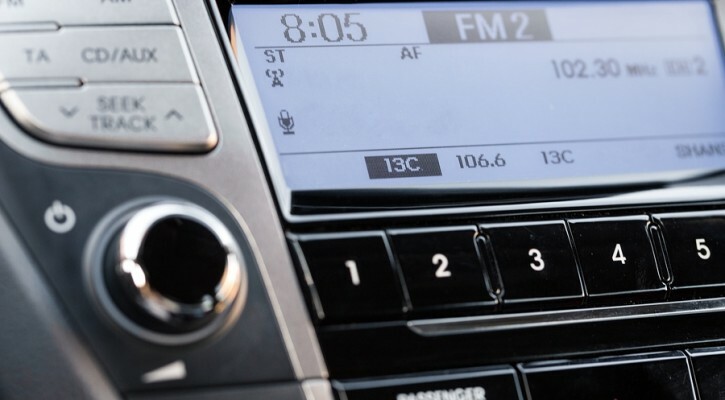 If you’ve ever turned down or turned off the car radio while looking for an address or navigating through a strange city, you’re probably instinctively aware of this fact. Paying attention to a cell phone conversation instead of the road ahead is the same thing. For more information, visit: Does listening to the radio make driving more dangerous? A recent FairWarning.org article points out that collapsing front seats can pose a serious danger to children in the back seat. While the National Highway Transportation Safety Administration (NHTSA) knows about the issue, they say there’s too little data to initiate any sort of mandate from the federal government to fix the problem. The problem comes when cars are struck from behind. As the car is suddenly pushed forward, the front seats can collapse and fall backwards. If that should happen, children riding in the back seat can be severely injured when they are struck by the front seat headrest, the seat itself, or by the occupant of the front seat. According to the article, some seats have been known to collapse in a 30 mph crash. The Insurance Institute for Highway Safety (IIHS) tests seats as part of their crash test regimen for new cars and, in fact, they remove the seats and test them on a sled separately from the car itself. However, the tests concentrate more on how much support the front seat and headrest will provide for its occupant to prevent whiplash and back injuries and not so much on the ability of the seat to remain upright in a higher impact crash. Parents who are looking for a new car can check the IIHS crash ratings for a particular model and it will show how well the seats performed in rear end crash tests but it’s important to remember that those tests are conducted to simulate a 20 mph crash and that may not indicate how well the seat will perform in a higher speed impact. You can see an example of the seat test here. For years, NHTSA has advised that because of the dangers posed by airbags to small children, children should be seated in the back seat. According to FairWarning, that advice doesn’t go far enough. They advise that children be placed in the back seat behind an unoccupied front seat or behind the seat with the occupant that weighs less (as in the photo above).